Whether your SUMMERTIME jam is from Jane's Addiction, Will Smith, or Mungo Jerry, there's no fighting it!! The days are long and ready for you to charge your favorite trails!! 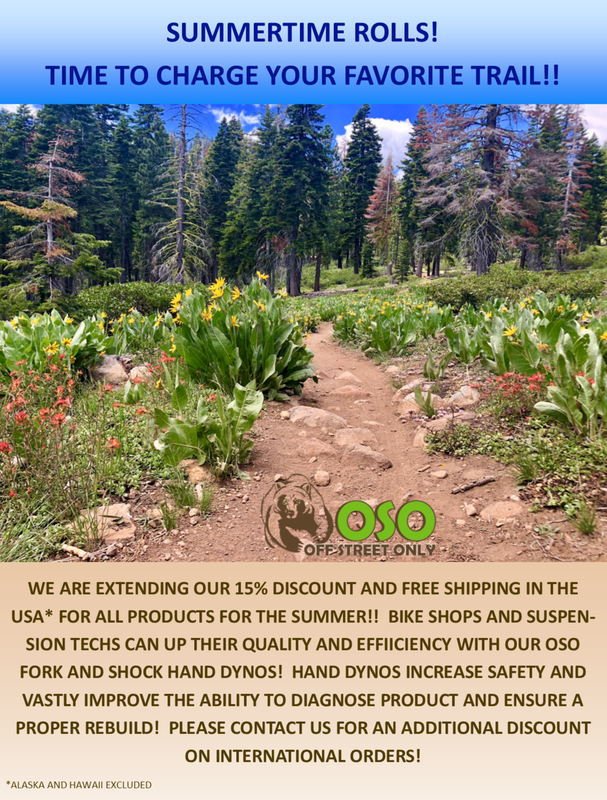 This of course means your suspension is about to undergo serious use and abuse and we want to make sure bike shops and suspension techs have their hand dynos ready to offer the best service possible! SPRING 2018 SALE - 15% OFF ALL Products continues. SPRING OUT of Hibernation and get your suspension tuned up by your local shop and suspension service crew! To have the most thorough service performed, we encourage employment of our OSO Hand Dynos at your local resource! This was a big year for OFF STREET ONLY, finally bringing its own products to the masses with just three months left in the year, and it has been great! OSO's little helper, Bessie, demanded we offer an end of year discount for all available PRODUCT! She is irresistible, so, here it is! It's a great feeling to reflect on the moves that were made this year and the positive reaction received. We are taking that energy into 2018 with more products and an eye on making our mark in the mtb suspension industry. The Team here wishes everyone a Healthy and Happy New Year ahead! !